Well January has come and gone and all of my seed orders should have been sent in by now. They haven’t! I spent most of two separate weeks being Grandpa to Noah, who is almost two. Great fun but you don’t get much else done on those days. He is happy to sit and read for a while but he prefers “Does A Zebra Have Spots” to any of my seed catalogues. While we can try to learn the alphabet going from Aubergine to Zucchini he just doesn’t seem to really enjoy the pictures. Now I’ll have to organize my seed ordering along time lines. There are some seeds that really need an early start and they should be in the soil in the next few days. I’ll order them first and then do some more orders a bit later. This is a very dangerous method. I should make a disciplined list of all the things that I have room for and then order them from the catalogues that offer the best value or variety choice or package size. I’m going to wind up with far more seeds than I can really use because I will be letting my heart rather than my head wander through the catalogues. The upside is that I will probably wind up with some new and interesting and possibly expensive varieties that my more methodical self would have eliminated. While I’m waiting for the first seeds to arrive I will have to reorganize the basement and make room for the additional light tables. 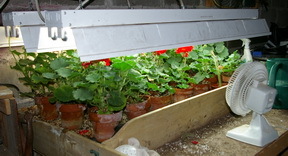 The amazingly successful Geranium crop continues to grow and take up almost all of the existing space. They are even getting a bit crowded and I have added a small fan in front of them to increase the airflow and hopefully decrease the possibility of fungus diseases and moulds starting in that damp still air. 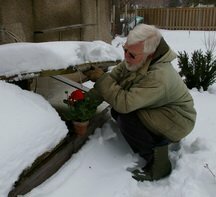 Even my nice heated cold frame is probably not warm enough to hold those Geraniums through the worst of February’s weather. Besides it is getting old and I noticed last fall that it had started to warp and shift, leaving some noticeable gaps between the various panels. Yes, fixing it was one of those jobs that didn’t quite get to the top of the list last fall. Now I’ll have to go out and do it with parka and mitts on; (picture at the top,) a somewhat less fun and efficient method. I’m growing more vegetables in containers each year, mostly just to prove that it can be done and to help all of my readers who are working with limited space. I’m also trying to get more creative in the flowers that I put into containers. I do the experiments and have the failures and you all get to just copy my successes and avoid the failures. I think I’m having fun and your gardens wind up looking much better than mine. It works for all of us. One of the seed catalogues that I provide a link to, Renee’s, has a long list of Sweet Peas available and she suggests some of them for growing as trailers in a container. They sound fascinating but they will need to be started early so I must get my order to her right away. I also have to keep in mind that we will be traveling to England for almost two weeks in early July. How many containers can I ask my neighbour to water for me and still have him speaking to me when I get back. What can I grow in those containers that will not demand water too often. I know that I could build a wonderful automatic drip irrigation system for the containers but that’s not really going to happen this summer; or at least not before the first week of July. There are always those vegetables, particularly peppers, that I start much too early just to see if I can get some vegetables a little earlier in the summer. Not that I’m a competitive gardener or anything. Nadia asks? Thanks for the reply on the geraniums. Also what is the best soil medium to use? Ken answers! I use a soiless mix because they are sterile,(no bugs, diseases or weeds,) easy to obtain and not heavy for carrying down the basement stairs. 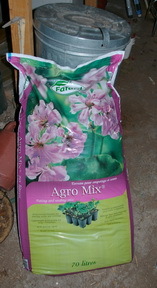 There are several on the market usually in 70 litre bags that should cost less than $10. Amanda asks? In your last newsletter you talk about watering indoor plants. I am having the same problem with the white stuff on top of the dirt. I have a water softener and it is hooked up to all of my taps. How should I be watering my plants? Ken answers! Well you could collect rain or in the winter melt snow but that seems a bit impractical. Most water softeners use the sodium in salt to exchange for the magnesium, that causes the hardness, in the water. Magnesium is a valuable plant nutrient and you know what road salt does to your lawn and shrubbery. Check in your basement there is probably a tap somewhere before the water enters the softener. Many water softener systems have a line that bypasses the softener and leads to the kitchen so that you can drink and cook without using salted, softened water.